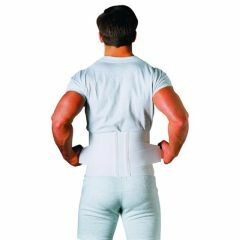 The Crisscross Lumbar Support has a nylon and elastic unisex style that provides an excellent abdominal and lower back support. The Crisscross Lumbar Support features flexible stays to prevent rolling. The wide, duo-tension straps encourage proper lifting. Measure hip circumference to size. Color white.